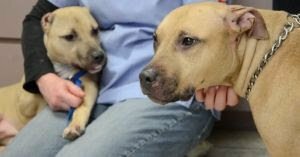 The mother of the puppy who was brutally abused by her owners is in need of a new home. Nassau County, NY - June 4, 2014 - Missy is a seven year old Pit bull who is the mother of Miss Harper, the puppy who was brutally abused by her owners. Missy was relinquished to the Nassau County SPCA saving her from euthanasia, so that we could find a loving home for her. When Missy was signed over to us, we immediately took her for medical care. Missy appears to have been bred often and had a few medical issues which were treated. She had a total blood workup, all shots and was spayed. Missy had a tough life she had two back to back litters where at least one puppy in both were brutally abused. But she is resilient and still is a very sweet, affectionate girl who will be a home run in a home as the only dog; all she wants is a loving owner and some attention. Subject: LongIsland.com - Your Name sent you Article details of "Nassau County SPCA: Miss Harper's Mom Missy Needs a Home"